Mother’s Day is just around the corner, so when Plaid Crafts sent me a whole box of Martha Stewart Craft Supplies and asked me to create a Mother’s Day project, I jumped at the chance. I decided to make some Mom-inspired, typographic subway art. I painted my plywood board with white spray paint. 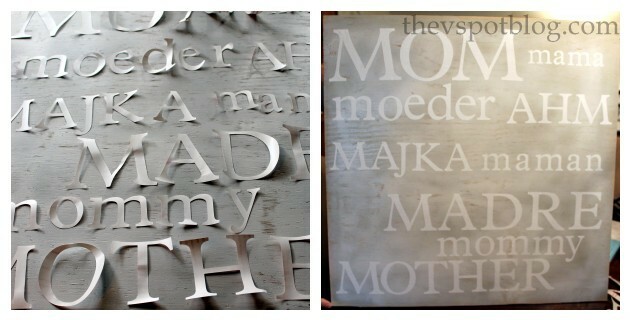 While it dried, I looked up the word “mother” in different languages and began to cut them out using my Cricut. I got a general idea of where I wanted the letters to go, then started adhering them to the board. Starting with the lightest color first, I began painting the top third of the board, then worked my way down to the darkest color, blending as I went along. Don’t you judge my paintbrush. We have a lot of history together and I love her. To be completely honest, about this point I tried to add stenciled roses to the back ground. Total craft fail… it looked awful, so I painted over them and pretended it never happened. While the paint is still a bit tacky, begin peeling off the letters. 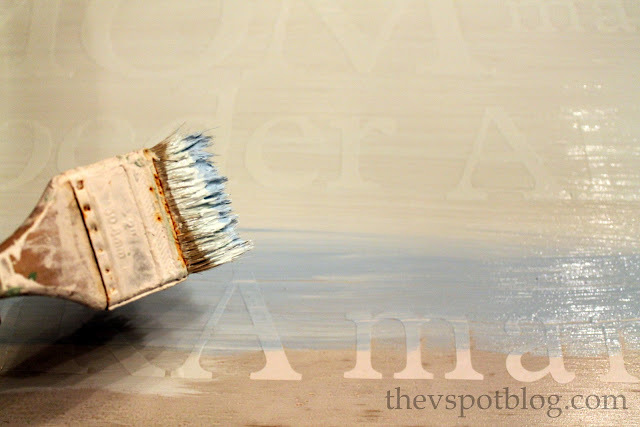 Let the board dry thoroughly, then sand it to create a distressed look. This is so sweet Viv!! 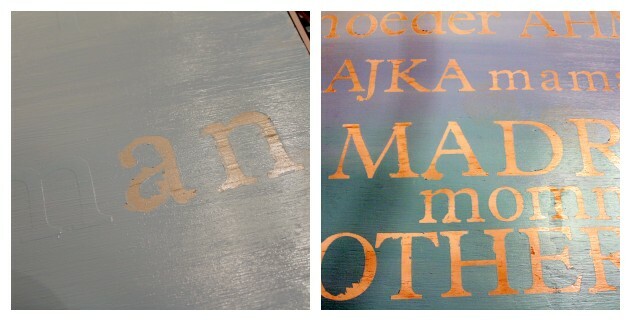 I love the ombre and the way the wood shows through in the letters! Loving the ombre! And the bare wood in peeking through. Cute idea!! That did turn out cute! I like the color choice and how it is shaded. I kinda like it with the bare wood showing through, but the white-washed look is really cute too! This is REALLY cool, Viv! It must have been great fun to get that box of goodies–and you put them to good use! Who wouldn’t want to get this for Mother’s Day? What a special gift that would be! I love the color choices too! The blue is great (well, my fave color :D) – and I too love how the wood background shows through. Perfect touch! I keep saying I’m going to make one for every season/occasion…you know how many I have done right? Love it! I’m such a fan of reverse stenciling and the ombre effect is superb! Great job! You are SO imaginative and talented, I would never have thought of doing that! Love this…the colors are fabulous!! Very cute, Viv! My project went up today too. So great to meet you at SNAP, it was a whirlwind of fun, wish I could have hung out with more of you home girls too. Not enough time to get with everyone. this is truly a special project! Lovely! Love love love this – I love the color and especially the wood showing through! Thanks – stopping by from Craft-o-maniac! 🙂 Thanks for linking up, Vivienne! I hope you’ll link up again soon! New link party starts every Thursday! How do you adhere the letters to the board? I don’t have a cricut so I was going to find a friend that may have one OR just purchase the letters. Sierra Mama, I used letters made out of contact paper. Just peel off the backing and stick to the board.